Kendall Jenner and Rihanna step out in same Ganni jacket - who wore it best? | HELLO! Rihanna and Kendall Jenner have both been adding Oriental-influences to their summer wardrobes with a Mandarin style jacket from Danish clothing label Ganni. 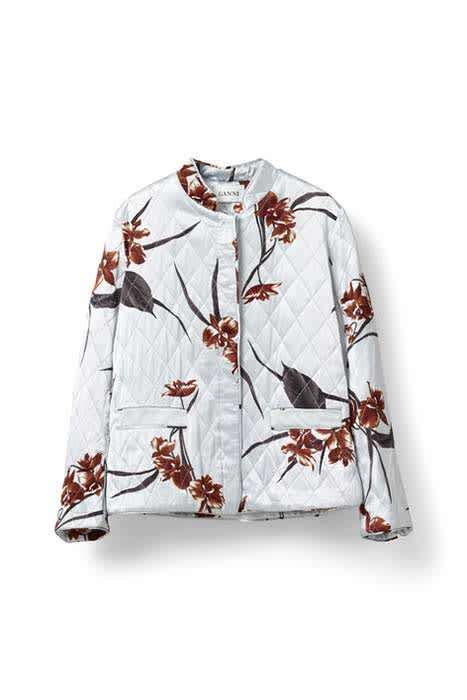 The pair have both been spotted in the Sanders quilted satin jacket from the brand, which retails for £260. Kendall was first to wear the piece, adding the statement piece to a muted all-black ensemble that included a crop top, flared trousers and Elizabeth and James aviator sunglasses for an outing in New York. The model is a fan of statement jackets, and has recently been seen in a number of fringed jackets and duster jackets to top off her off-duty outfits. Rihanna wore the same jacket just a few weeks later during a trip to Milan, with a photo of the Stay singer posted on the Ganni Instagram account. "@badgalriri wearing Ganni Sanders satin jacket and dress in Milan #ganni #gannigirls #rihanna," the photo was captioned. Unlike Kendall, Rihanna wore the jacket with a satin dress from the same collection featuring the same floral motif. She teamed the £170 slip dress with white trainers and a choker for a laidback yet striking look. Other pieces available in Ganni's Sanders collection include a satin tank top, jogger style trousers and a jumpsuit, with prices starting at £125. Rihanna and Kendall are not the only high profile fans of the brand, which was founded in 2000. Kendall's younger sister Kylie Jenner was recently seen out in a Ganni suede biker jacket, while Rose Byrne, Alexa Chung and Kate Moss have all worn pieces from the Danish store in recent weeks. Who do you think wore the Ganni jacket best?